One of the biggest reasons soldiers join the U.S. Marines is to take part in an adventure. In addition, military recruits are drawn to the Marines because they want to meet and overcome the challenges, physical and mental, of becoming a Marine. 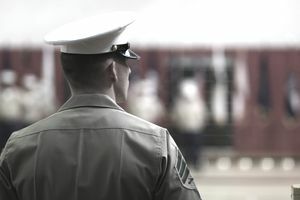 According to the United States Marine Corps, no other ​billet in the Marines, or any service, can live up to the importance of Marine Security Guard duty. Marine security guards provide security at about 125 U.S. embassies and consulates around the world. They are primarily responsible for interior security at embassies, usually in the lobby or main entrance. Guards are trained to react to terrorist acts, as well as a host of emergencies, such as fires, riots, demonstrations and evacuations. They're obviously trained a much higher level than any civilian security guard, but the basic role of the Marine security guard is keeping the peace. According to the Marine Corps website, the security guard program began in 1948, but is predated by a long history of cooperation with the U.S. Department of State. "From the raising of the United States flag at Derna, Tripoli, and the secret mission of Archibald Gillespie in California, to the 55-days at Peking, the United States Marines have served many times on special missions as couriers, guards for embassies and delegations, and to protect American officials in unsettled areas," the website states. In order to qualify as a security guard position, a Marine must be in the rank of E-2 through E-8. Marine security guards have to be U.S. Citizens, and have to be eligible to receive top secret security clearance. Armed Services Vocational Aptitude Battery (ASVAB) test. This is waiverable in some circumstances, but those with a score lower than 90 on the GT section are encouraged to retake the ASVAB. Since in many instances they'll be the first visible point of contact for the Marines and foreign dignitaries and others, Marines who want to serve as security guards must have no visible tattoos in while in uniform, and they have to meet Marine Corps weight and fitness standards. And since the work they're doing requires integrity and discipline, Marine security guards must have no records of nonjudicial punishment within a year of applying for the job. Marines in the rank of E-5 and below who want to serve as security guards must be unmarried, with no dependents. However, those Marines who have children but are not the primary caretakers are not immediately disqualified (i.e. paying child support or alimony is not an immediate disqualifier). Marines in the rank of E-6 and above may have up to four dependents, including spouses, and still qualify for this job. If they meet all the critieria and are accepted into the program, Marines attend the security guard school at Quantico, Virginia.